Lei & Liu’s recent article: “Research trends in applied linguistics from 2005 to 2016: A bibliometric analysis and its implications” (2018) is possibly one of the most revealing accounts of recent changes in the popularity of research topics, authors and publications in applied linguistics since the turn of the (albeit rather short) current century. Based on analysis of data from 42 peer-reviewed journals in Applied Linguistics, it reveals what many of us are feeling or writing about; a sustained move away from the cognitively-oriented research that dominated the SLA literature in the 1970s-1990s, and towards more socioculturally-oriented, multilingual research into language learning and teaching. David Block’s discussion of this change back in 2003 (pp. 136-9) now seems rather prophetic (see my blog discussing his problematisation of “SLA” here). While I agree with their interpretation, Lei and Liu err on the side of caution when extrapolating from their data, which is fully understandable for an academic piece. But in this blog, I want to share what I took away from it – my more personal thoughts on what their data seem to be saying. Firstly, I couldn’t resist playing with their supplementary data, available online. While they chose to rank the changes according to statistical significance (using chi-square), and only discussed the most notable changes, I felt that they somewhat understated the massive changes in their data for some items, and I was surprised that they didn’t choose to graph any of it… So I did my own sums, calculating the percentage change between 2005-08 and 2013-16 in the normalised frequencies they provide, and then converted these values into a… very long… chart! See Figure 1 (the top), Figure 2 (the bottom) and Figure 3 (the whole thing). I’m very much aware that a non-statistically significant difference, however large, may be due to random fluctuation or noise, so I’ve made this clear in the figures, using green bars for items that they calculated showed significant increases (p < .05), and red for those showing significant decreases (p < .05). However, you’ll agree with me, I dare say, when I express surprise that the 1062% increase in the use of the term “mixed method” over the period (from 0.65 to 7.55) is very likely NOT due to random variance, but more likely due to the well documented increase in the use of mixed methods in the social sciences this century (e.g., Creswell, 2009), even if the increase of the term in their analysis, isn’t statistically significant! When reading the article or the analysis below, bear in mind that this is based on bibliometric details from Web of Science, which includes title, abstract, keywords (and abbreviated references) but not the main body of the paper. Because of the need to be economical with word count in an abstract, newly established terms are very useful, and thus the frequency rise of some of the expressions below may be partly attributable to this (not mentioned by the authors). Which terms have shot up in usage? Some terms have appeared that were rarely or less commonly used in article titles and abstracts in 2005-8. All of the following showed over 700% increase in usage: “social class” (highest with 1643% increase), “multilingualism”, “teacher cognition”, “lexical diversity”, “mixed method”, “linguistic landscape”, “mobile device”, “eye tracking” and “academic English” (see Fig. 1 below). Several of these are not surprising, including “mobile device” and “eye tracking” both of which relate closely to the emergence of these technologies, but “mixed method” and “academic English”, neither of which are discussed by the authors, are also notable. It is particularly surprising that “social class” has leapt, almost out of nowhere, over this period, although a large amount of this usage may derive from sociolinguistics, rather than language teaching research, but it’s interesting nonetheless: so much for a classless society in the 21st century! Figure 1: Changes in applied linguistics topic frequencies 2005-8 to 2013-16. Top of chart only. There has been a big increase in discussion of Englishes and multilingualism, with “multilingualism” increasing 1372%, “bilingual education” increasing 207% and English as a Lingua Franca (ELF) increasing 270%. Also up are “late bilingual”, “linguistic diversity” and “world English”. This is paralleled by a rise in citations of 2 key publications by García (2009) and Blommaert (2010) reported in the paper. Translanguaging makes an appearance in the list of most highly-cited publications since 2005, through the work of Creese & Blackledge (2010), although Angela Creese may be a bit annoyed that the authors spelt her name ‘Creece’! It seems that Block (2003) predicted an important sea change in our interests concerning how languages are learnt. 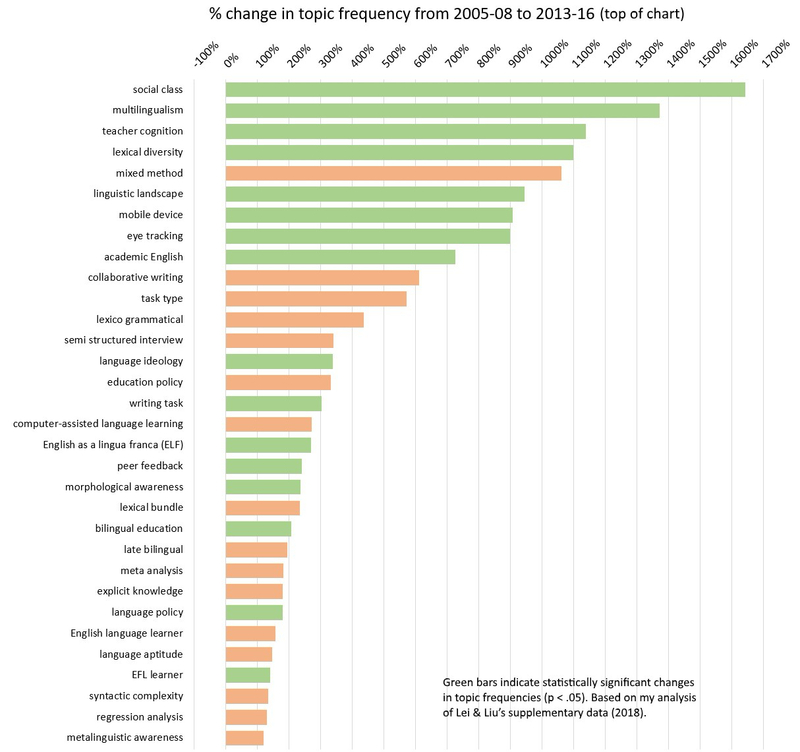 Figure 2: Changes in applied linguistics topic frequencies 2005-8 to 2013-16. Bottom of chart only. The apparent decline in interest in cognitive processes does not necessarily represent a lack of interest in learner characteristics per se, even if generative themes are losing popularity. It is paralleled by an increase in more psychological ones (motivation and identity particularly), with “motivation” showing one of the strongest statistically significant increases as a topic (despite ‘only’ exhibiting a 71% increase, due presumably to consistently high frequency counts) and Dörnyei (2005) now topping the list of most highly-cited publications since 2005. Any evidence of changes in classroom practices or teaching strategies? Several of the most increased terms hint towards changes in classroom practice, including “academic English” (up 727%), and perhaps related to this a 611% increase in “collaborative writing” and a 304% increase in “writing task”, indicating that, perhaps, more formal, written skills are coming back into importance in the post-communicative era. “Peer feedback” is another noticeable increase (241%), perhaps reflecting an increase in recognition of learner agency, learner-centred practices, or simply an increase in average learner proficiencies over the decade – beginners aren’t as good as giving peer feedback as advanced/academic learners. Borg’s influence on teacher education is also present, detected through references both to his work (2006), just creeping into the top 20 of the most-cited recently published works, and through the 1140% increase in the term “teacher cognition” (3rd in my chart) over the period. While the USA, the UK and Canada still dominate authors (or rather, the corresponding addresses of lead authors) in publications (accounting for almost 40% in 2013-6, compared to over 60% in 2005-8), several non-Anglophone countries are climbing the ranks rapidly, including China, Taiwan, Turkey and Iran. The authors link this to the increased use of “EFL learner” (up 142%), and the increase in interest in ELF as non-Anglophone countries no longer seek guidance for models and norms from the British or the Americans. Of course, the very rapid rise in the use of some of the terms over the period could represent nothing more than a fad – a transient trend towards certain themes discussed above. Lei & Liu point out that a key finding in the study is that the popularity of many topics has “remained essentially constant over the three periods” (p.7), citing the 81% of topics that do not exhibit statistically significant changes. However, this isn’t really what we see in their raw data, and may simply be due to very low frequencies on some items (this, I presume, is why the >1000% increase in “mixed methods” reported fails to be statistically significant). Taken individually, each statistic has a margin of error, but viewed as a sample, the findings can be interpreted rather differently: only 35 of their 165 topics (21%) show a change of less than 20% between 2005-8 and 2013-6. 15 years later and we can say that this research is reflecting something many of us are feeling in the field: Block did read trajectories accurately, and there has indeed been quite a strong social turn in both SLA and applied linguistics. See the full figure here and below. Figures in this piece are based on my own analysis of supplementary data produced by Lei & Liu (2018), available here. I calculated the percentage change between their 2005-08 and their 2013-16 normalised frequency scores for each topic (they divided the frequency by the total number of articles surveyed in each period). Blommaert, J. (2010). The sociolinguistics of globalization. Cambridge: CUP. Clahsen, H., & Felser, C. (2006). Grammatical processing in language learners. Applied Psycholinguistics 27, 3–42. Creese, A. & Blackledge, A. (2010). Translanguaging in the bilingual classroom: A pedagogy for learning and teaching. The Modern Language Journal 94, 103–115. Creswell, J. W. (2009). Mapping the field of mixed methods research. Journal of Mixed Methods Research, 3(2), 95-108. García, O. (2009) Bilingual Education in the 21st Century: A Global Perspective. Oxford: Blackwell. Lantolf, J. P. (2006). Sociocultural theory and second language learning: State of the art. Studies in Second Language Acquisition 28:67–109. Figure 3: Changes in applied linguistics topic frequencies 2005-8 to 2013-16. My analysis of Lei & Liu’s data (2018). very informative thx, would be interested in getting hold of the data?